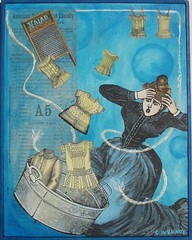 You can now preview the 383 art pieces donated for Collage Mania 2009, the Fiberarts for a Cause fundraiser for the American Cancer Society. 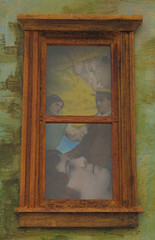 These collages will be sold on-line May 5-7, 2009, with all proceeds going to ACS. This year the artists will be shipping directly to the people who bought their art. 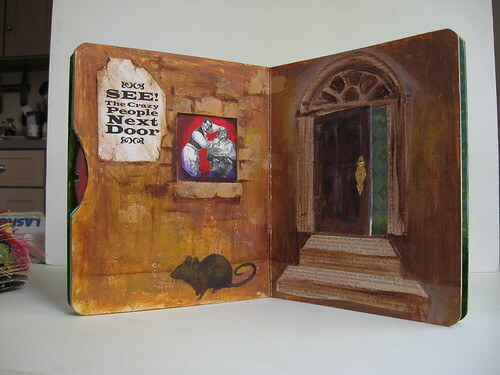 Many fiber and mixed media artists are participating in the event including Patricia "Pokey" Bolton, editor of Quilting Arts and Cloth Paper Scissors magazines and Lesley Riley, author of Quilted Memories and Fabric Memory Books. 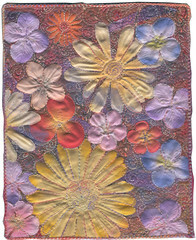 Pictured here is my donated art quilt, "Spring to Summer" (blogged here), which is on page 4 of the Collage Mania entries. This is my first year to participate, and I'm glad I got the chance because this is apparently going to be the last year for the event. Participating in Fiber Arts Friday! Fair Tomorrow (above) was the lucky contestant! 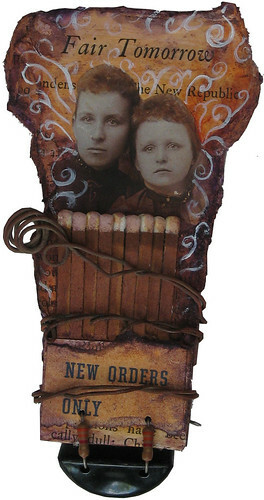 I made it in Michael deMeng's Matchbook Reliquary workshop at Raevn's Nest Art Retreat last October. 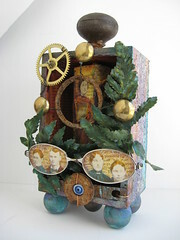 In fact, it's one of my few assemblage projects that actually got finished on the day instead of languishing for months. 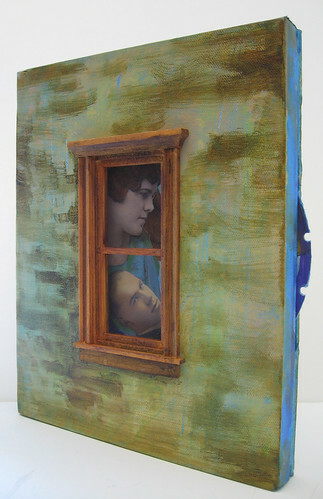 The other two pieces I had submitted were Neglected Memories (below, which DID languish for months after I started it in Michael's Morpheus Box class in Oct.) and Internal Affairs already discussed in a previous blog post. In fact, the main reason I pushed myself to submit to this show was because I needed a deadline to force myself to stop fiddling and finish Neglected Memories! Anyone have any suggestions? Sometime before the end of the day today I have to decide on a title for this piece so I can fill in my paperwork to submit it for a show tomorrow. 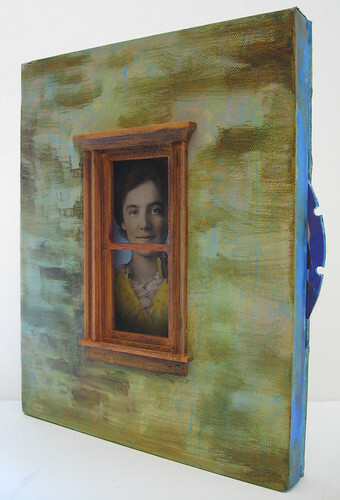 It's an 8x10" canvas with a dollhouse window inserted in the center and a spinner lodged between the canvas and back that rotates the images in the window, all vintage photos from my collection. 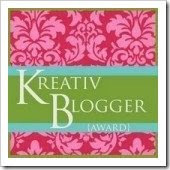 Cathy was kind enough to give me this creative blogging award, so go check out her artwork! I'm supposed to direct you towards 7 other crafty bloggers and tell you 7 random things about myself, so I'm going to try to do both simultaneously. 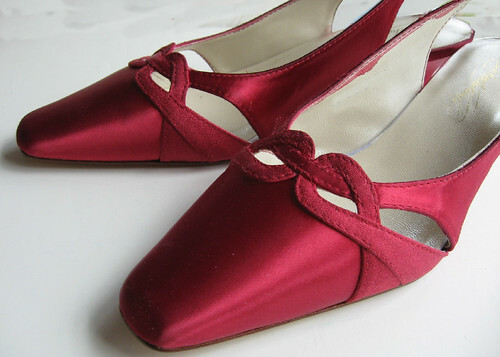 3) Mel doesn't blog but she has a fabulous Flickr photostream, which is just as good. We share a love of retro fonts and goofy ephemera. 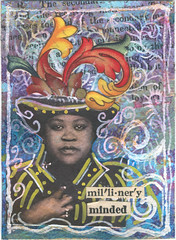 5) Lynne, aka Gypsy Art, drives up from Illinois to trade ATCs with the Milwaukee ATC group, which I nominally organize (because organizing artists is like herding cats). 7) I have never met Max of Made By Max, though we both live in the Milwaukee area but I love his daily comics on Flickr, esp. his cat-themed ones because I live in a house ruled by 2.5 cats (the Outdoor Cat only gets half the power of the indoor ones). 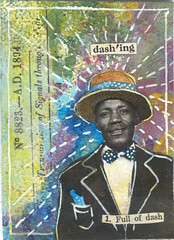 Life has been busy, and I'm running a week behind on Make It Mondays - Last week's theme was Hats, and I actually made these ATCs last weekend but haven't had a chance to scan them until now. 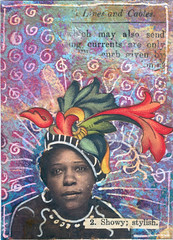 The Milwaukee ATC group's April theme is "Altered Photographs," so I used vintage photos from the Ten Two Studios Octavia collage set and embellished with acrylic paint, ink and these colorful flourishes cut from some fancy-schmancy wrapping paper. The two ladies above went the most over the top. The lady and gentleman below are a bit more subdued in their approach to fashion. 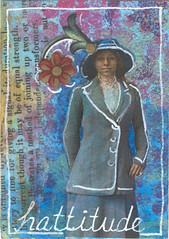 April 1 is the deadline for sending in jpg submissions for "Collage Mania 2009" a fundraiser for the American Cancer Society. 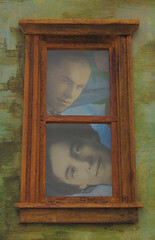 This is my first time participating in Fiberarts For A Cause, but I understand that the donated collages will go into an on-line exhibit and then be available for purchase at specified times at the beginning of May. (Here are the details.) You can see last year's gallery here. 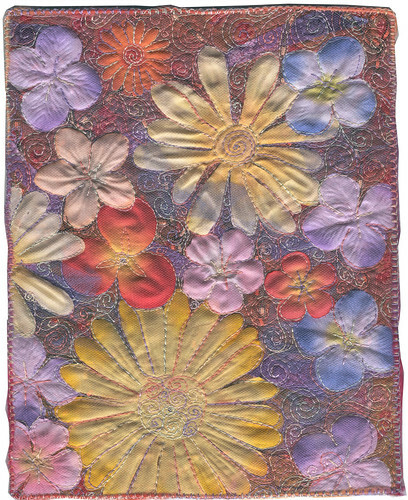 My donation "Spring to Summer" is an 8x10" fantasy floral art quilt. The background is hand-painted cotton layered with parts of faux silk flowers held in place by a layer of tulle and free-motion quilting. I have a photo walkthrough for this technique on Flickr. I used kunin felt as the support/backing. 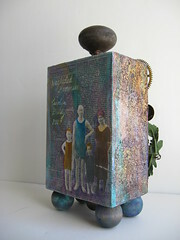 This was donated in memory of my mom's older sister Flo whom we lost to cancer in 1997.